We have all seen them on television during the Olympics; these powerful men performing amazing skills with ease and grace. Watching them perform the question inevitably arises - are they as powerful as they look? And the answer is - yes. What will probably be even more surprising to you is that they build their strength and physiques almost entirely with various bodyweight exercises. The list of requirements is long and can be rather daunting to prepare a world class athlete: passive flexibility, active flexibility, joint preparation, static strength, dynamic strength etc. etc. and is probably only interesting in detail to those of us involved with the physical preparation of champions. There are of course some supplemental exercises where weight is added (i.e. weighted leg lifts), however the central premise remains; these amazing athletes have built the vast majority of their strength and power through the use of bodyweight conditioning. Now another question that we should ask ourselves - is the bodyweight training of the Olympians also beneficial to the fitness enthusiast? And if so, is it possible to apply at least some of it to those without a professional instructor to guide them or tens of thousands of dollars of specialized gymnastics equipment? And the answers are once again - yes and yes. There are some of our specialized exercises that are relatively easy to learn and require little or no equipment beyond a chin-up bar and some floor space. 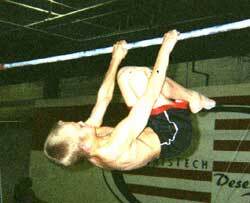 In this article, I will cover the basic progressions needed to learn two primary gymnastics exercises: the planche and the front lever. This will be by no means a complete bodyweight training program, but rather an introduction. These two movements were chosen for their novelty, the simplicity of the movements and for the excellent strength gains that are possible for those who are willing to commit the necessary sweat and dedication. The planche will be our pressing movement and the front lever will be our pulling movement. At advanced levels, adding a pushup to the planche and a pull-up to the front lever will effectively give a fairly intense full upper body workout, including the abs and lower back. Now before continuing further into our training, let's first regress and consider the question of why to do bodyweight conditioning in the first place? A common misconception is that bodyweight exercises do not build substantial strength but are rather more suited for building endurance. For most people this conjures images of endless pushups, sit-ups or for the strong, perhaps pull-ups and dips. Great maybe for general fitness or endurance, but of little value in building real strength. First of all, exercise is exercise. Period. The name of the game is resistance. A muscle contracts against resistance and, with perseverance, over time, becomes stronger. For strength to increase, the amount of resistance or load worked against must also increase over time. Hence the problem with bodyweight conditioning - as the resistance (weight of the body) is fixed, how to continue to increase strength? Surprisingly the answer is simple - by decreasing the amount of leverage it is possible to exert on an exercise, the resistance of an exercise becomes increasingly greater. For example, a hanging straight leg lift is much harder than a tucked leg lift. In both exercises the weight of your legs remains constant, however by reducing your leverage (i.e. in this case straightening your legs) we are able to greatly increase the resistance. By straightening the legs we have effectively doubled the difficulty of the exercise even though the weight of the body has remained constant. With experience and creativity it is possible to learn or design exercises that, done correctly and with the proper progressions, are so lacking in leverage that even at bodyweight levels of resistance it is possible to build staggering amounts of strength. 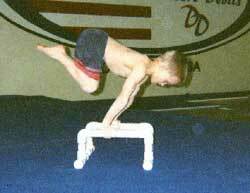 In addition to strength, the athlete will also develop excellent balance, coordination, agility and exceptional core strength. Perhaps that is why spectacular film athletes like Jackie Chan and Mark Dacascos always include gymnastics training in their physical preparation. How well do the progressions that I am going to share with you work? 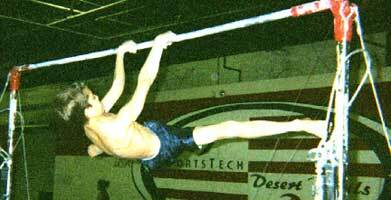 Well, consider that fact that Mr. Mas Watanabe recently visited my men's gymnastics program and was astounded by the levels of strength and development he saw. For those of you outside the gymnastics community, Mr. Watanabe has been for the past 30 plus years, one of our primary leaders of men's gymnastics here in the United States and has personally worked with and evaluated every Olympian, World Championship, National, and Junior National Team member that our country has produced during this time. After observing my current athletes completing their daily bodyweight conditioning program, Mr. Watanabe informed me that they were the strongest most physically prepared group of athletes he had ever seen. In fact he went so far as to state that he had never even seen another group come close. 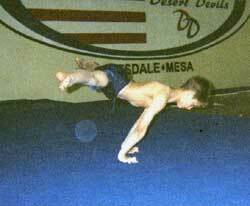 Now the main point that I would like to emphasize here - is that their physical development was procured almost exclusively through consistent progressive bodyweight conditioning. How strong is it possible to become with bodyweight exercises? Amazingly strong. In fact I would go so far as to say, done correctly, far stronger than someone who had trained for the same amount of time with free weights. Want some concrete examples? One of my former students, JJ Gregory (1993 Junior National Champion on the Still Rings) developed such a high degree of strength from my bodyweight conditioning program that on his first day in his high school weightlifting class he deadlifted 400lbs., and this at the scale breaking weight of 135 lbs. and a height of 5'3". After this I was curious and wanted to measure JJ's one rep max on weighted pull-ups. We started fairly light with 10 lbs. or so. I continued adding more weight while JJ performed single rep after single rep. Unfortunately I didn't know about chinning belts and chains at that time and the cheap leather belt we were using broke at 75 lbs. Once again, I repeat, at 75 lbs. 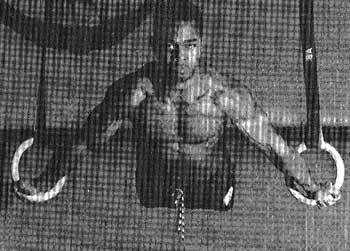 and JJ had never performed a weighted pull-up in his life. But he had performed years of my specialized bodyweight conditioning exercises. How much could JJ have chinned that day? We will never know for sure, but I will tell you that at 75 lbs. JJ was laughing and joking with me and did not appear to be noticeably bothered by the weight. And JJ, while the strongest, is not an isolated case. For example, over the years I would occasionally (once a year or so) allow my athletes to test their one rep max on weighted chins (an exercise we never perform as part of our regular conditioning) simply so that they could have proof positive of the enormous measurable strength gains which they were enjoying. My own son at the age of 13 and a bodyweight of around 110 lbs. could chin 50 lbs. for 8 reps and it was not at all unusual for a 60 lb. younger athlete to perform 5 or more reps with 25 lbs. In addition to his amazing strength, look again at the incredible physique that JJ built solely through various bodyweight exercises. Also look at the pictures of some of my current group of athletes. Pretty buff for boys who mostly range from 7-11 years old and have never lifted weights. As well, consider the fact that as competitive athletes, they never train for appearance. Their physiques are solely the result of their training their bodies for the function of becoming better athletes. In other words, their physiques (and anyone else's who trains in this manner) are functional first and ornamental second. Why does correct bodyweight conditioning work so well? There are several, the first is contraction. Basically, the harder the contraction over a greater part of the body during an exercise, the more effective the exercise. For maximum improvements training to failure is not necessary, but maximum contraction is. One of the main advantages to these advanced bodyweight exercises is that they require a complete full body contraction. In fact, at advanced levels, they are so demanding that it is simply not possible to complete them any other way. 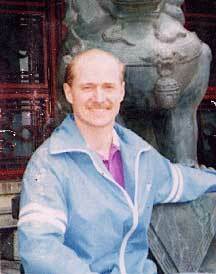 Another primary reason for their beneficial results is the nature of the static holds themselves. By holding the bodyweight in a disadvantaged leverage position, we are effectively multiplying the resistance of our bodyweight. Or more simply stated, we are supporting a heavy weight in a locked static position. This has tremendous positive impact on the strength of the joints and connective tissue and aids greatly in overall strength development. Many great weightlifting champions have sworn by the benefits of holding heavy weights in a locked position. Two that immediately come to mind are Paul Anderson and John Grimek, who both made heavy supports a regular part of their early training. Success at these exercises requires consistent incremental improvements. Do not seek improvement quickly or become frustrated after only a few weeks. You would not poke a seed into the ground and then jump back waiting for the plant to explode out instantly. You must be patient with physical conditioning also. While you may become more skillful or feel more powerful while performing a new exercise relatively quickly, this is due to becoming more neurologically efficient ("greasing the grove"), rather than experiencing an absolute gain in strength. 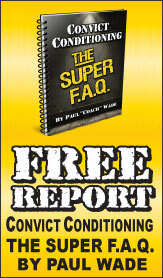 It takes approximately 6 weeks to establish the first concrete strength gains. In other words, make haste - slowly. Be prepared to spend at least six months at these exercises to work through the various progressions. What?! Six months?! Yes, that's right, at least six months. Some people may need to spend a year or more. You wouldn't expect to bench press 300 lbs. right away. Nor should you expect to build high level bodyweight strength instantly either. Be consistent, be patient and soon you too can be enjoying the benefits of greatly increased strength and athletic ability. Alright enough talk, let's get down to work and learn these progressions so that we can begin building some muscle. The following progressions will teach you how to perform the planche and the front lever as well as their more advanced variations; planche pushups and front lever pull-ups. We will begin with various static (non-moving, held) positions. From there, we will progress to the more dynamic pushing and pulling movements. You will use the same basic strength progression on all of the following exercises. Be sure to master one position in a progression before moving onto the next. Hold for sets of however many seconds you feel comfortable, while continuing to combine the time of your sets until you reach 60 seconds total time. The number of sets it takes to reach the 60 seconds combined total time is irrelevant. All that matters is that you accomplish 60 seconds of "quality work". Once you can hold a position correctly for the entire 60 seconds in one set, it is time to move on to the next harder exercise and begin the training procedure all over again. Now there are some exceptions to this rule, but we will address them later as we come to them. Static holds can be performed each day for maximum benefit. However it is also possible to obtain excellent results with other workout schedules. The traditional Monday, Wednesday, Friday or Tuesday, Thursday, Saturday work well. My personal favorite that allows maximum work combined with substantial rest is Monday, Tuesday, Thursday, Friday. Everyone's recovery ability is different. Simply experiment with the various schedules to see which suits your individual needs best. Static holds can easily be placed anywhere in your current routine. My preference is to place them at the end of our physical preparation time. Once you have progressed to the more demanding planche pushups and front lever pull-ups, they should be placed in your workout in an appropriate spot for that exercise and body part and the static holds can continue to be placed at the end of the workout. You should work your way through the various progressions of both the planche and the front lever at the same time. As they work complementary muscle groups, working these two exercises together will actually increase the speed of your overall improvement as well as providing you with balanced development and strength in your shoulder girdle and core. Obviously, for those of us who are mere mortals, it is not possible to simply remove the legs from the floor and go directly to the planche. However with the proper planche progression exercises and patience, this position is attainable by a reasonably fit, hard working athlete. While working the various planche progressions, strive to hold the hips level with the shoulders. Make sure that the elbows are straight. Bending the elbows greatly lessens the intensity of these exercises and will greatly slow your progress. Almost straight is still bent, so be diligent and keep them straight. 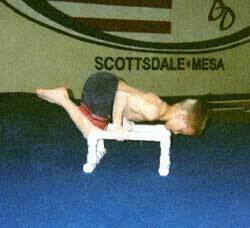 One final general note on planches; hand positions on the planche progression exercises are completely optional. Some prefer fingers forward, others to the side. Some swear by support on fingertips (my favorite) and others completely flat. Just experiment and find the grip that you prefer. If you find that a flat hand support on the floor is too uncomfortable for your wrists, these progressions can also be performed on a set of push-up bars. Begin this position by assuming a full squat and placing your hands on the ground directly in front of your feet. By directly, I mean right next to your toes. Arrange yourself so that your knees are resting against your bent elbows. Now gradually lean forward taking your weight both unto your hands and also unto your knees by leaning them on your elbows. Using your knees on your elbows will allow your legs to help your shoulders bear the load of your bodyweight. As you continue leaning forward you will eventually be able to remove your feet completely from the floor and hold yourself up with only your hands on the floor and your knees on your elbows for support. Balance is also a key to this exercise. As you first begin to learn how to lean forward in this position, you will often probably overextend and fall forward. Don't worry have fun with it and enjoy some new training. Some pillows placed in front of you will help to cushion any crash landings. Notice that this is the only static position in our progressions with bent elbows. Continue holding sets of this position until you have reached your one minute total time. The main difference between the frog stand and the tuck planche is that now your weight will be entirely supported on your arms only. Once again begin in a full squat and place your hands next to your toes. Now, as in the frog stand, lean forward taking all of your weight on your arms and shoulders alone. Do not use your knees on your elbows for assistance. Holding the knees tightly to the chest will make this exercise easier. At first you may only be able to briefly raise off the ground. Do not worry. Keep adding small sets together to reach your goal of 60 seconds total. Simply continue working the position, striving to lift your hips to shoulder high. With consistent practice it is possible to increase your strength in static positions relatively quickly. Once you feel comfortable with the tuck planche and are able to hold it for 60 seconds with correct hips and elbows, you can increase the difficulty of this exercise by progressing on to the Advanced Tuck Planche. 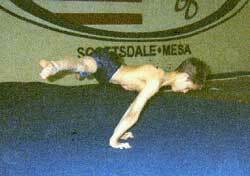 The primary difference between the tuck and advanced tuck planche is the position of the back. 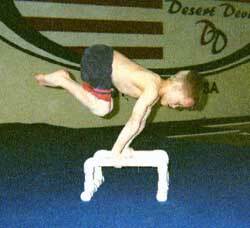 Note that in the tuck planche the back is curved, while in the advanced tuck planche the back appears flat. While holding your hips shoulder high, try to extend your hips back behind you until your back is flat. This "flattening" will greatly increase the intensity of the tuck planche. In fact, I think you will be extremely surprised at how much harder such a small movement can make the tuck planche. Continue working this position, until you are once again able to hold the static for 60 seconds correctly in a single set with your back completely straight ("flat"). 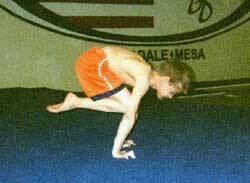 Once you have mastered the advanced tuck planche position you are ready to work on the straddle planche. Finally! After months of hard consistent work the end is now in sight. While learning this skill, it is also beneficial to practice the next progression (the tuck planche push-up) at the same time. One will build upon the other. From the advanced tuck planche position, simply begin to extend your knees behind you from their position on your chest. Balance is critical here. As you extend your legs farther behind, you will also have to lean a little farther forward to compensate. The wider your legs are the easier the straddle planche will be (note: for those of you planning for the future, as you get stronger in the straddle planche you can increase the difficulty by bringing your legs closer together). Make small adjustments from workout to workout trying to either increase the length of your static hold or the extention of your position. Do not try to increase both at the same workout. BE PREPARED - just a small movement will greatly lessen your leverage on this exercise and make the movement much harder. This movement is so much more difficult, that it is not necessary to be able to hold it for 60 seconds before moving on. 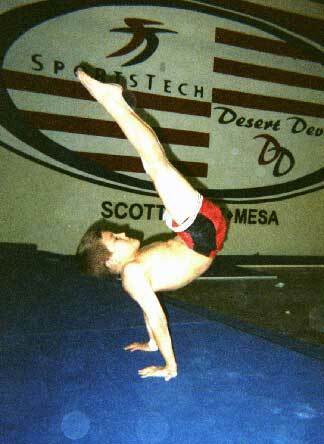 Once you can hold a straddle planche correctly for 10 seconds you will be able to move on. I know, I know . . . only 10 seconds! But trust me, it will feel like much longer while you are doing it. By the time you begin working straddle planches, you will have achieved a reasonable amount of static strength and are ready to begin adding a dynamic movement to your static hold. 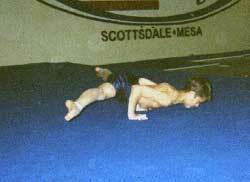 The description of a tuck planche push-up is fairly straightforward; while in an advanced tuck planche position, simply attempt to perform a pushup. To receive the full benefit, be sure (or at least try!) to maintain the hips level with the shoulders during the descent and ascent of this movement. Don't forget to fully straighten the elbows at the to of the movement. Reps and sets are completely up to you. Once you have learned both the straddle planche and tuck planche push-ups, you are now strong enough to tackle straddle planche push-ups. You could consider the planche pushup a super bench press or a full body press. In addition to working the triceps, chest and front delts, you also have a full contraction of the lats, middle back and lower back as well as the traps. The triceps and the forearms are also working hard stabilizing the elbow joint. Core strength is extremely taxed as the upper and lower abs, obliques, serratus and hip flexors all struggle to maintain the stretched (body) position. From the straddle planche, begin to lower yourself to the ground. Be careful to keep the hips level with the shoulders as you descend, as there is a tendency when first learning this skill to simply try to dip the shoulders forward. Pause just off the ground and extend back up to the straddle planche. Also be aware that as you rise from the bottom position, it will be quite a struggle to maintain your hips level with your shoulders. 1) Lower slightly, hold for a few seconds and continue lowering and holding. 2) Try to lower as slowly as possible, taking 10, 20 or even 30 seconds to complete the descent. 3) Lower all the way, lift up slightly and lower again and repeat. As before, we will begin our training progression with various static positions and from there progress to the more difficult pulling movements. For the front lever series be sure to use a shoulder width overhand grip (fingers pointing away) as this will increase the amount of power you can exert during these exercises. Also, as with the planche series, it is very important to keep the elbows straight as bending the elbow will lesson the intensity and possible gains of these exercises. Using any kind of comfortable support (chin-up bar, tree branch, rings etc. ), hang using an overhand grip (i.e.. with fingers pointing away from you). Bring your knees to your chest and then strive to lift your hips in front of you while at the same time leaning back with your shoulders. At this time it is fine to allow your back to curve as you learn and build strength in the movement. Your goal is to eventually be able to pull your hips up to horizontal or level with your shoulders with an approximately 45 degree angle between the arms and torso. This is however, a very difficult position for beginners and you will probably need to build up to it gradually. At first, simply lift your hips as high as you can and begin timing your sets. As before, combine your sets until reaching a total time of 60 seconds. Upon reaching a 60-second hold in a single set, it is time to once again move on to the next progression. 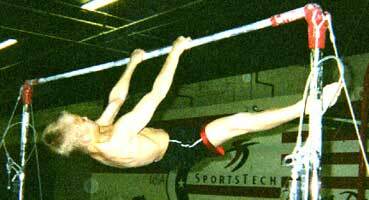 Once the tuck front lever feels firmly in control, it is time to move on to the advanced tuck front lever. As with the advanced tuck planche, the main difference here is the "flat" back. This position will cause all of the muscle fibers in your back to fire as they struggle to handle the load of your bodyweight. The contraction will be intense. Your goal is to eventually be able to pull your hips up to horizontal or level with your shoulders with an approximately 45 degree angle between the arms and torso while maintaining your "flattened" back. To achieve this position, think of pulling your shoulders back away from your hands while at the same time pressing your hands down towards your hips. Be sure to remember to keep hips shoulder high and elbows tight and straight. Continue combing sets to your usual 60 second total and striving for that 60 second single set static hold. From the advanced tuck front lever position, begin to carefully and slowly extend your legs out from your chest. As with the planche, the wider your legs are spread, the easier the transition from the advanced tuck front lever to the straddle front lever will be. Strive to maintain your "flat" back position. If you are unable to do so, you are too far extended forward and need to pull your legs back a bit. Don't forget to keep the shoulders pulling back and the hands pressing down. 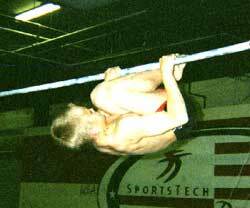 While working on the straddle front lever, it is also fine to begin learning the tuck front lever pullup. 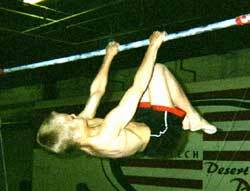 From the advanced tuck front lever you may now attempt to pull yourself up. Basically this is a horizontal pullup. It is incredibly difficult to hold the hip level with the shoulders during the pull. As you pull up, your hips will want to drop down and as you lower, your hips will want to stay elevated. These changes occur as your body struggles to find an easier way to complete the movement. Maintaining the horizontal position here is the key for exceptional back development. Straddle front lever pull-ups are essentially a full body weight row and will make you incredibly sore from head to toe. 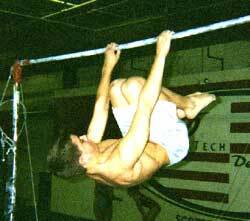 Do not attempt this movement until you are proficient at both the straddle front lever and the tuck front lever pull-ups. Doing so anyway will not injure you, you simply will not be strong enough to complete the exercise correctly. This movement is an especially good overall conditioner for the back, as this one exercise alone will work the back completely from the traps to the lats to the mid back down to and including the lower back. Biceps, forearms and shoulders are obviously also heavily worked. Core strength is once again extremely taxed as the entire mid section struggles to maintain the stretched (body) position. From the straddle front lever position, begin to pull your upper stomach to your hands. Be careful to keep the hips level with the shoulders as you rise, as it is very easy to simply let the hips and legs drag and turn this movement into a simple pull-up. Pause at the top and extend back down to the straddle front lever. 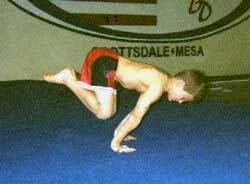 The possible variations are much the same as those for the straddle planche pushups, only adapted to pulling rather than pushing. Well, there you have it. A simple and effective set of progressions for learning and benefiting from at least part of the training of Olympic Champions. Avoid regular training to failure. Extreme strength, a great build, and a lot of fun -all done in minutes per day. What more could one ask for from a workout? 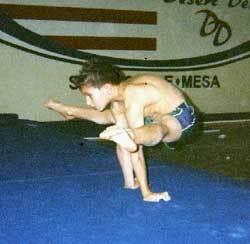 Christopher Sommer is a professional gymnastics instructor with over 25 years experience and has coached numerous State, Regional and National Champions. 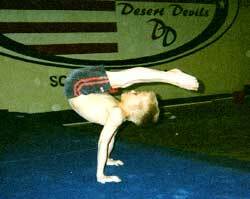 He is the Men's Head Coach at The Desert Devil Gymnastics National Team Training Center in Mesa, Arizona and has the premiere men's gymnastics program in the Southwestern United States. The preceding article was an excerpt from Coach Sommer's upcoming book Building the Olympic Body. 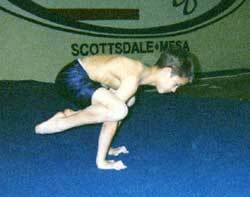 Coach Sommer is available for seminars, clinics and private gymnastics training and may be contacted at (480) 844-9600 (gym) or email at OlympicBodies@aol.com.